The Architect of the Capitol's (AOC) Senate Subway Branch operates two subway systems to transport senators, staff and escorted visitors between the Capitol Building and the Senate office buildings. The systems operate from 7:30 a.m. to 6 p.m., Monday through Friday, and continue running until at least 30 minutes after the last floor vote when the Senate is in session. The subway to and from the Capitol Building and Russell Senate Office Building consists of two 18-passenger cars built in 1958, which have been in continuous operation for nearly 60 years. The subway is powered by motor generators in a large silver panel at the center of the car, with an on-board operator to manually run the system. 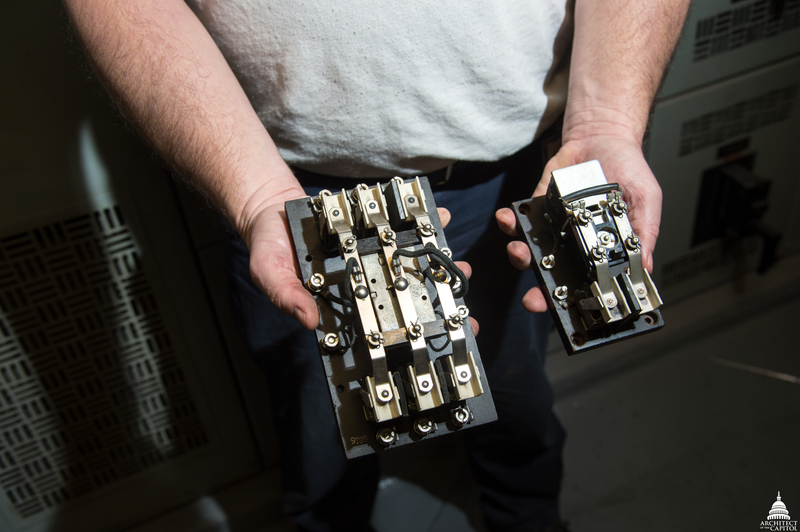 Two relay switches are used to open and close the doors on the Russell Building subway cars. 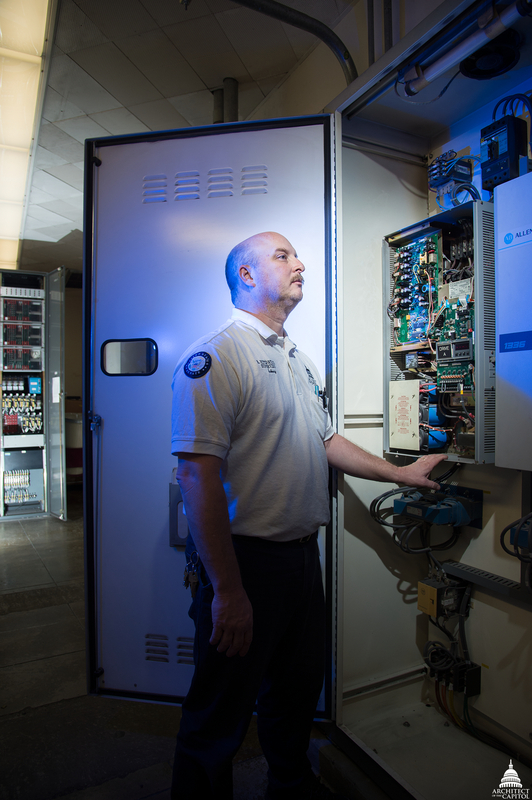 In the subway to the Dirksen and Hart Buildings, the same task is performed by programmable logic controllers, rather than physical switches. The subway to and from the Capitol Building and Dirksen and Hart Senate Office Buildings consists of three 36-passenger cars on a looped track. The 21-year-old, fully automated system features linear induction motors which are located in the tracks themselves, with an operator controlling the system from a nearby mechanical room. ABOVE: Eric Fitzpatrick looks over the frequency drives for the subway system to the Dirksen and Hart Buildings. These drives power the fully-automated linear induction motors in the tracks, which make the cars go; VERY TOP: Craig Smith prepares to change out a load wheel on the subway to the Dirksen and Hart Buildings in the Hart Maintenance Station. The subway staff performs monthly preventive maintenance checks to detect wear and replace the wheels, as needed. 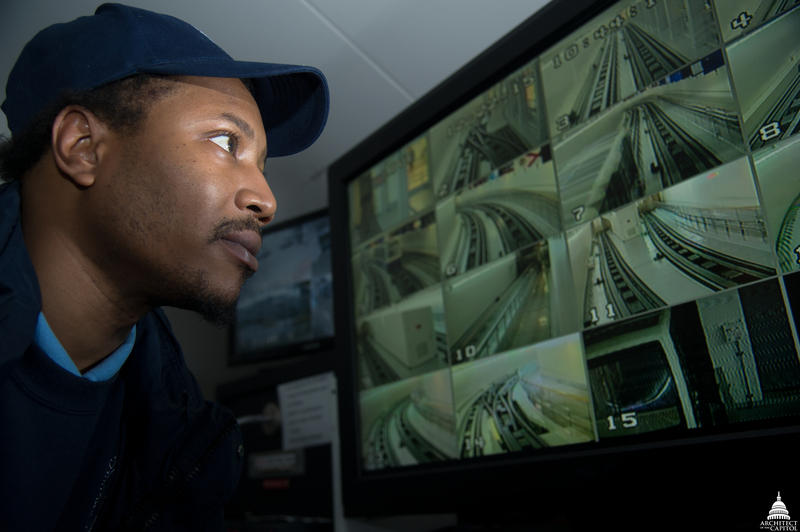 Erick Gage views the automated subway system to the Dirksen and Hart Buildings from a nearby control room. Staff continuously monitor the system so they can prevent many problems and respond quickly whenever they occur. 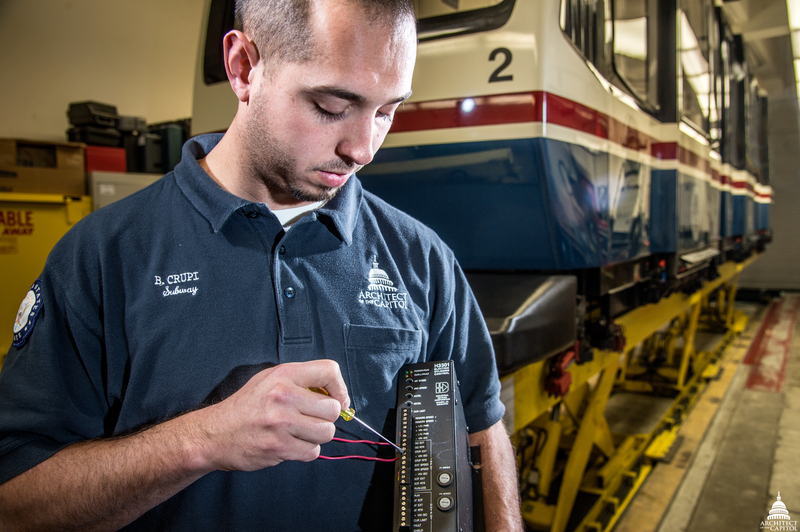 Brian Crupi works on a switch control cabinet which allows operators to move a subway car to the Dirksen and Hart Buildings from one track to the other for maintenance work. The Senate Subway Branch includes 14 full-time employees with 138 years of combined Architect of the Capitol service. According to Eric Fitzpatrick, Electromotive Equipment Supervisor, "Because of the staff's experience and workmanship, our system has a reliability rate of 99 percent or better. They also show true professionalism in everything they do." This is awesome! Can you write an article on the chitty chitty bang bang subway on the House side? I had e great pleasure and thrill to ride the Senator Subway Systems during my December visit two years ago. Thanks to the wonderful Senator Tammy Baldwin for the once in the life time opportunity.